After the critical and box office disappointment of Poetic Justice, Singleton returned to more issue-minded cinema with 1995's Higher Learning. The film follows a cross-section of students at fictional Colombus University as they head down varied paths during one tumultuous semester. The central characters are Malik (Omar Epps), a freshman on a track scholarship; Kristen (Kristy Swanson), a naive freshman out of Orange County, California; and Remy (Michael Rapaport), also a freshman, whose alienation leads him to join a group of Neo-Nazi skinheads. Kristen's storyline, in which she is date raped and turns to the consoling arms of Taryn (Jennifer Connelly), a lesbian, largely has little association with the linked, racially-oriented ones of Malik and Remy, but by film's end all three storylines converge in a dramatic fashion. Thematically, though, all three main plot threads are consistently linked in the sense they show how young people strive to find their rightful niche in a university, much like they try to find one in life in general, sometimes going down the wrong path--as in the case of Remy, whose adopted ideology of hate inevitably leads to violence. But it is with the skinheads that Remy finds a sense of belonging and purpose, something he clearly lacks in the film's opening stages. Kristen personifies young people's natural fascination with the new and unexplored (in her case, lesbianism). Malik, like so many young people, struggles to find a sense of direction in general, not applying his best efforts on the track, in the classroom, or anyone else, much to the chagrin of his girlfriend Deja (Tyra Banks) and his political science professor Mr. Phipps (Laurence Fishburne). Higher Learning spoke a lot to me in its initial release, which occurred during my first year at UCLA (which, coincidentally, was where it was filmed). A film-minded student unable to attend film school at the time, I also had difficulty trying to find some sort of direction or meaning in my being there. (I never did, but that's beside the point.) Even so, the film, while good on the whole, was and still is a flawed endeavor. 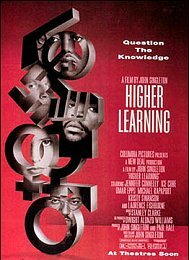 Higher Learning has been chided as the preachiest of Singleton's films, and it is; the explosive conclusion, while undeniably effective, bludgeons the audience with its message of tolerance, racial and otherwise. The idea of racial tolerance is obviously the more prominent in Singleton's mind, and as such, Kristen's storyline is not as clearly developed. Nonetheless, Higher Learning is an entertaining and thought-provoking film, bolstered by strong performances by Epps (though one wonders what Singleton's original choice for Malik, Tupac Shakur, would have done with the role), Swanson (surprisingly), Rapaport, Connelly, Banks, and Singleton vets Fishburne, Regina King (as Kristen's roommate), and Ice Cube (as an Afrocentric student).